CCT Tapes produces adhesive tapes in many different forms, covering all of the major categories of tape. CCT also produces many custom constructions and laminations, based on individual needs and applications. Contact us to learn more about our custom capabilities. Our current products catalogs detail our broad portfolio of current core products, which is expanding and growing all the time. Click here to download our current Industrial Products catalog. 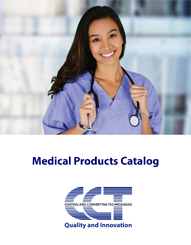 Click here to download a copy of our Medical Products Catalog. Double coated tapes have an adhesive coated on both sides of a central carrier, often a thin (0.5 mil) polyester, but many films, papers, foams and more can be used. These products also use release liner, which is normally also double sided and uses a differential release to enable easy unwind and application. The adhesive on each side of the carrier can be the same, but can also be different, for example using a high tack adhesive on one side and a lower tack adhesive on the other. Similarly, the two adhesives can be different thicknesses, all depending on what performance is needed for the application. Single coated tapes have an adhesive applied to one side of a backing material. 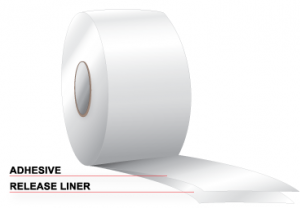 The backing could be a film, paper, non-woven, foil, foam or many other materials. 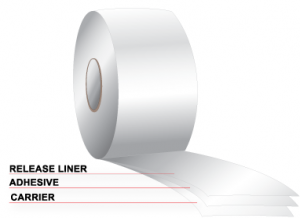 If the opposite side of the backing has a release coating, then the tape can be “self-wound” without the need for a release liner. If not, then a release liner is also commonly used. 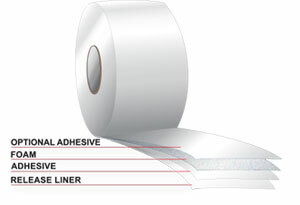 Transfer tapes or unsupported tapes have a coating of adhesive on one side of a double sided release liner. There is no additional backing or supporting material. These tapes can be converted into other types of tape product by lamination to another material, or can be used directly to bond two materials together. Foam tapes are single or double coated products, with a release liner, that use a layer of foam as either the backing or carrier. Most commonly this can be a polyethylene or polyurethane foam, although other types exist. 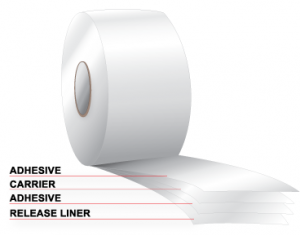 The foams can come in many densities and thicknesses which all impart very specific properties to the tapes.